We recovered one of the drinks of yore, to accompany something that is ours, the appetizer. A bit of green, a new vegetable, in hands of a spoon or simply opening mouth… Thinking what will come later. With shining eyes, the loins terse and of course, with well red gills. ANGUS: Original race of Ireland, implanted from 1920 in the Argentinian pastures, they are hooky two-year-old females that they graze freely iin the open field, for this kind of meats are the lowest in fats and cholesterol. FRISONA O SIMENTAL: Breeds native from Central Europe. They are animals from 10 to 12 years, which in their first stage are used for milk production and subsequently they are fattened to improve the quality of their meat. The meat has great infiltration with fats and his color is yellowish. Beautifully and succulent tasty, thanks to the fat infiltration and the time left to mature. WAGYU: Ancient breed that for centuries it was used as a draft animal. In the early twentieth century in the “Meiji” was the adoption of Western customs introduced the consumption of meat in the Japanese diet and this helped discover the qualities that led to the Wagyu to become a plate of wordship, even declared a National Treasure of Japan. Its meaning “Japanese cattle” and their meat is also known as Kobe Beef. 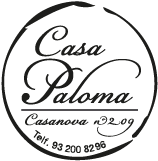 In Casa Paloma we are work employed togrther with “Cárnicas Lyo”, which they do of his work with passion. They locate blond Galician cows and oxen for all Galicia when still they are alive and are sacrificed in A Coruña. With these pieces of meat we try the most difficult thing still, the ripeness to extremes.